John Philip Busby was born in Bradford in 1928 and attended Ilkley Grammar School. After National Service, he studied at Leeds College of Art and then at Edinburgh College of Art (ECA) where he was awarded post-graduate and major travel scholarships. On return from France and Italy he was invited to join the staff of ECA, where he taught drawing and painting from 1956 until 1988. In 1959 he was commissioned to paint the mural Christ in Glory in the Scottish Episcopal Church, St Columba-by-the-Castle in Edinburgh. A member of the Royal Scottish Academy (RSA) and the Royal Scottish Society of Painters in Watercolour (RSW), he served as President of the Society of Scottish Artists, (SSA) 1976-79. A life-long bird watcher and naturalist (at age 17 he was at the inaugural meeting of the Wharfedale Naturalists Society in 1945), he was a founder member of the Society of Wildlife Artists (SWLA). 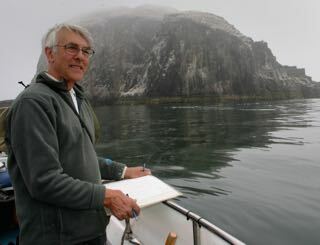 He led courses in Switzerland, Crete, the Falklands and Galapagos Islands, in Orkney and at Nature in Art in Gloucestershire, and in 1989 he began a Seabird Drawing course based at North Berwick. Now named after him, this has continued each year since, attracting participants from many parts of the world. He took part in projects with the Artists for Nature Foundation (ANF) in Holland, Poland, Spain, Ireland, India, Portugal and Israel, and in SWLA/Forestry Commission projects in the New Forest and in the oak woods in the west of Scotland. In 1991 he was filmed in Shetland for the Granada TV production “Portrait of the Wild – Summer‘. John illustrated over 35 books about birds and animals, mostly about behaviour, ranging from seabirds and garden birds to tigers and otters, plus a book of poems by Kenneth Steven (Wild Horses) and many of the illustrations in The RSPB Anthology of Wildlife Poetry. His own books are mentioned elsewhere but also include a booklet Landscapes at the Edge of the Sea in 2010 with his rock pool paintings, and another for the first Curious Eye exhibition which he curated at the RSA in 2007. In 2009 he was declared ‘Master Wildlife Artist’ by the Leigh Yawkey Woodson Art Museum in Wisconsin USA. He exhibited widely both at home and abroad and had a major retrospective exhibition at Bradford City Art Gallery in 1999/2000. More recently a retrospective exhibition, planned before his death, was held at Nature in Art, Gloucester in August 2015, and two large exhibitions to celebrate his landscapes (at the Royal Scottish Academy) and drawings (at The Scottish Gallery) were held in Edinburgh in June 2016, with another at the Wildlife Art Gallery in Lavenham, Suffolk in November 2017. In 2019 a major exhibition of his landscape paintings will be held during the Edinburgh Arts Festival, 29th July to 2nd September at the Open Eye Gallery in Edinburgh.